Hint: "--- -- ---'- -- tell me you're not leaving"
Song Quiz [Fanatic] Level 50 Cheats, Solution for Android, iPhone, iPad, iPod. 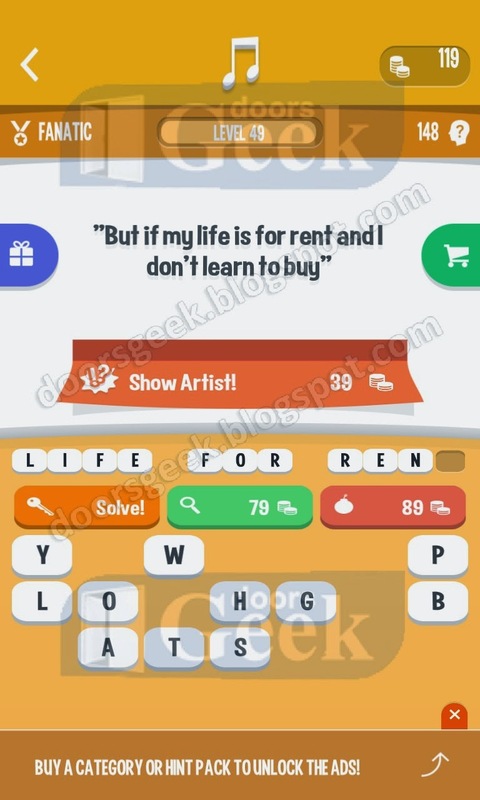 Hint: "But if my life is for rent and I don't learn to buy"
Song Quiz [Fanatic] Level 49 Cheats, Solution for Android, iPhone, iPad, iPod. 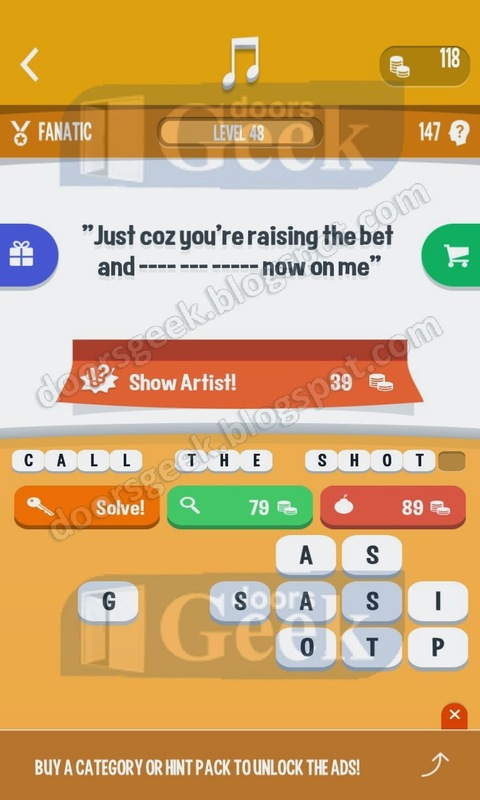 Hint: "Just coz you're raising the bet and ---- --- ----- now on me"
Song Quiz [Fanatic] Level 48 Cheats, Solution for Android, iPhone, iPad, iPod. Hint: "In your hand in your hand. 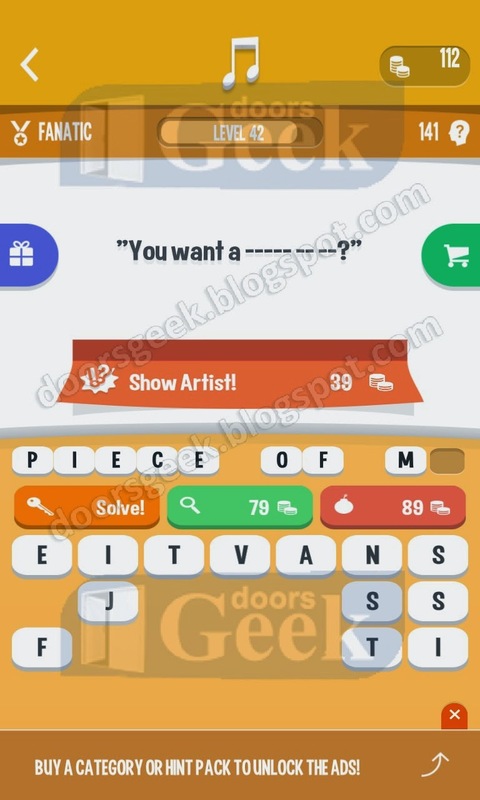 ------"
Song Quiz [Fanatic] Level 47 Cheats, Solution for Android, iPhone, iPad, iPod. 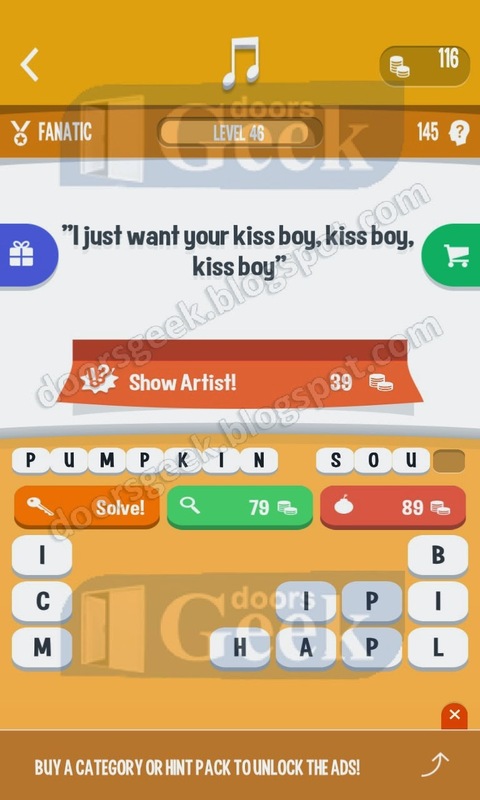 Hint: "I just want your kiss boy, kiss boy, kiss boy"
Song Quiz [Fanatic] Level 46 Cheats, Solution for Android, iPhone, iPad, iPod. Hint: "Where you gonna sleep tonight?" Song Quiz [Fanatic] Level 45 Cheats, Solution for Android, iPhone, iPad, iPod. 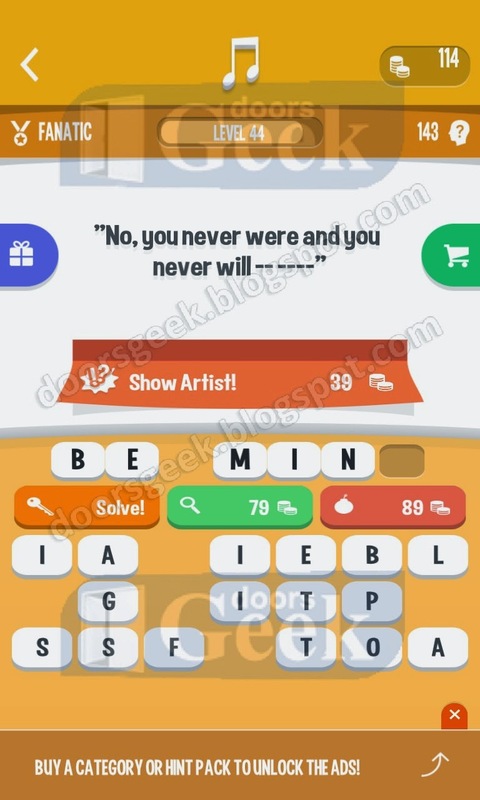 Hint: "No, you never were and you never will -- ----"
Song Quiz [Fanatic] Level 44 Cheats, Solution for Android, iPhone, iPad, iPod. Hint: "Hey hey I wanna be a --------"
Song Quiz [Fanatic] Level 43 Cheats, Solution for Android, iPhone, iPad, iPod. Hint: "You want a ----- -- --?" Song Quiz [Fanatic] Level 42 Cheats, Solution for Android, iPhone, iPad, iPod. Hint: "Darling don't be afraid. 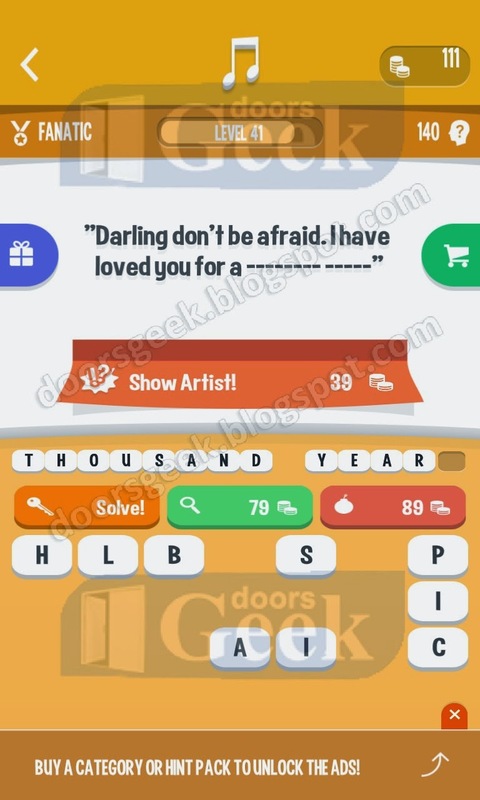 I have loved you for a ------- ------"
Song Quiz [Fanatic] Level 41 Cheats, Solution for Android, iPhone, iPad, iPod. 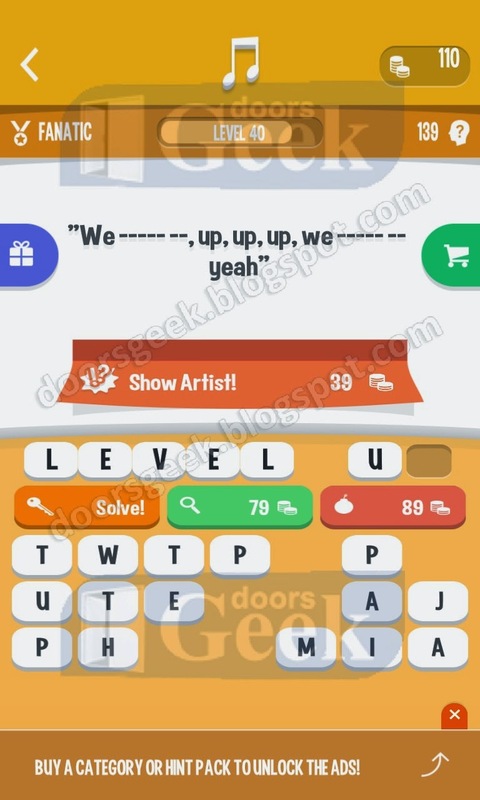 Hint: "We ----- --, up, up, up, we ----- -- yeah"
Song Quiz [Fanatic] Level 40 Cheats, Solution for Android, iPhone, iPad, iPod. 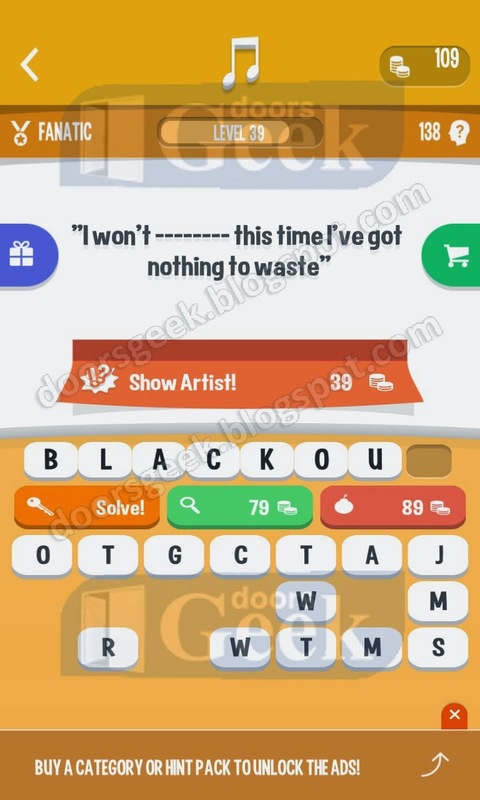 Hint: "I won't -------- this time I've got nothing to waste"
Song Quiz [Fanatic] Level 39 Cheats, Solution for Android, iPhone, iPad, iPod. Hint: "-- -- --------, I can't hide it"
Song Quiz [Fanatic] Level 38 Cheats, Solution for Android, iPhone, iPad, iPod. 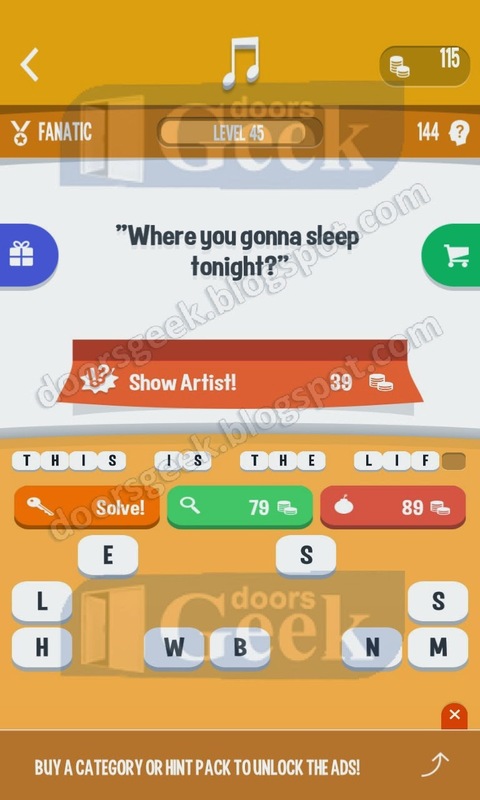 Hint: "Oh, oh, oh, oh, oh, sometimes I get a ---- -------"
Song Quiz [Fanatic] Level 37 Cheats, Solution for Android, iPhone, iPad, iPod. 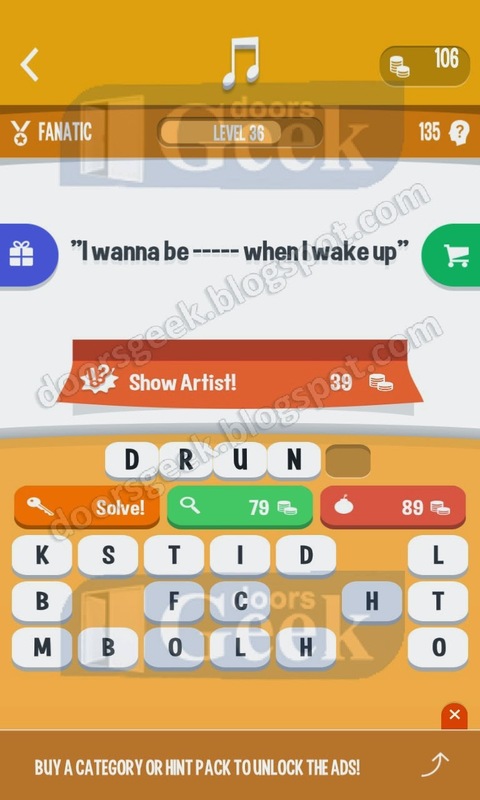 Hint: "I wanna be ----- when I wake up"
Song Quiz [Fanatic] Level 36 Cheats, Solution for Android, iPhone, iPad, iPod. 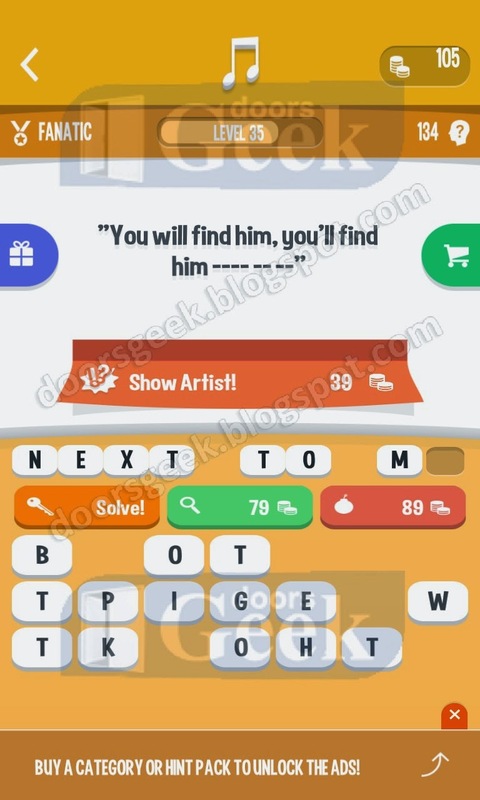 Hint: "You will find him, you'll find him ---- -- --"
Song Quiz [Fanatic] Level 35 Cheats, Solution for Android, iPhone, iPad, iPod. Hint: "Coz every girl crazy 'bout a ----- ------- ---"
Song Quiz [Fanatic] Level 34 Cheats, Solution for Android, iPhone, iPad, iPod. Hint: "But there's a side to you that I never knew never knew"
Song Quiz [Fanatic] Level 33 Cheats, Solution for Android, iPhone, iPad, iPod. 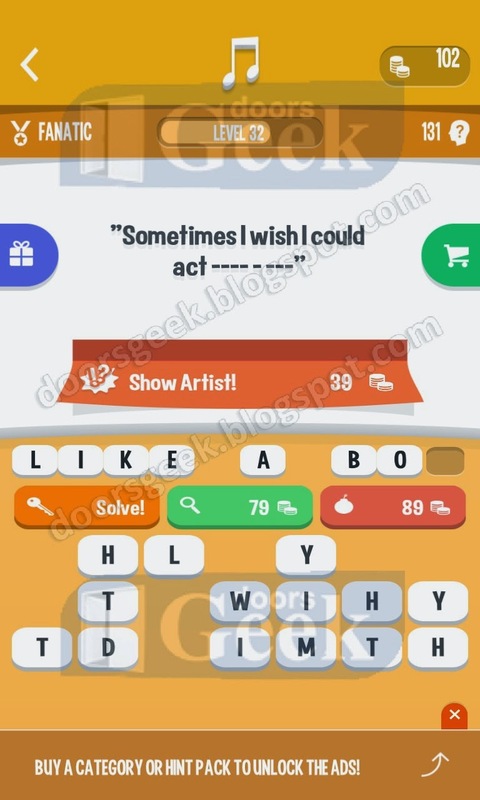 Hint: "Sometimes I wish I could act ---- - ---"
Song Quiz [Fanatic] Level 32 Cheats, Solution for Android, iPhone, iPad, iPod. 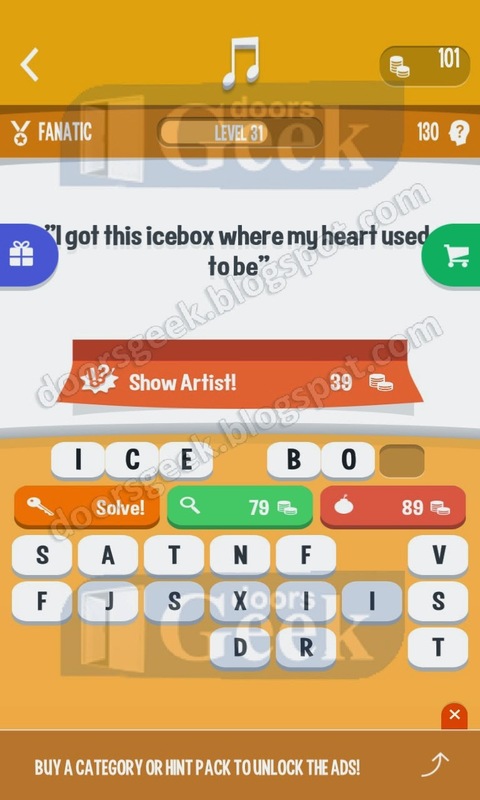 Hint: "I got this icebox where my heart used to be"
Song Quiz [Fanatic] Level 31 Cheats, Solution for Android, iPhone, iPad, iPod. 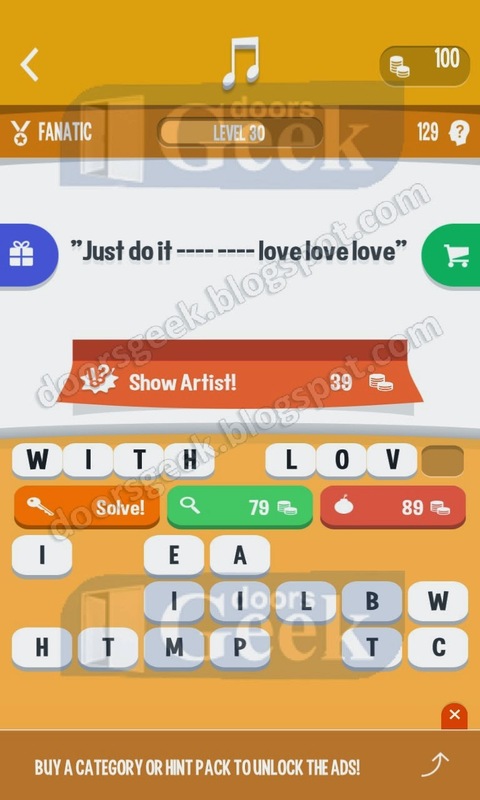 Hint: "Just do it ---- ---- love love love"
Song Quiz [Fanatic] Level 30 Cheats, Solution for Android, iPhone, iPad, iPod. Hint: "Would you lie with me and just forget the world?" Song Quiz [Fanatic] Level 29 Cheats, Solution for Android, iPhone, iPad, iPod. Hint: "Can you ---- -- ----? Can you ---- -- ----?" Song Quiz [Fanatic] Level 28 Cheats, Solution for Android, iPhone, iPad, iPod. Hint: "I met her in a club down in old Soho"
Song Quiz [Fanatic] Level 27 Cheats, Solution for Android, iPhone, iPad, iPod. Hint: "Mamma mia, here I go again. My my, how can I resist you?" 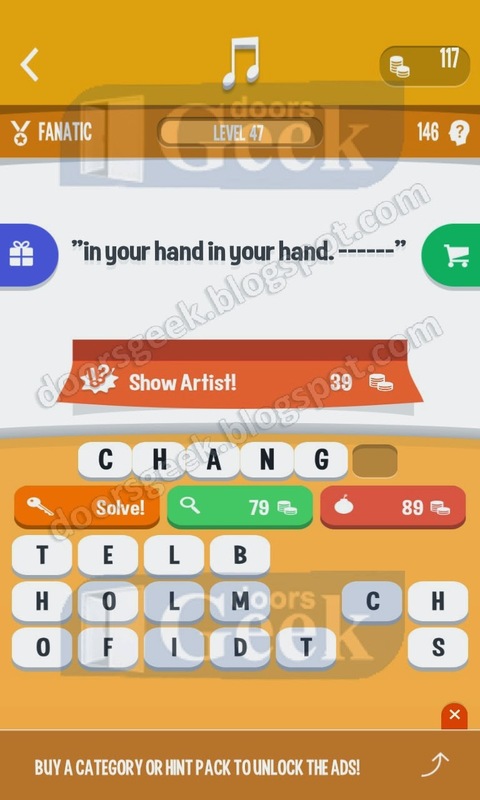 Song Quiz [Fanatic] Level 26 Cheats, Solution for Android, iPhone, iPad, iPod. Hint: "her name was --- ----, --- ----"
Song Quiz [Fanatic] Level 25 Cheats, Solution for Android, iPhone, iPad, iPod. 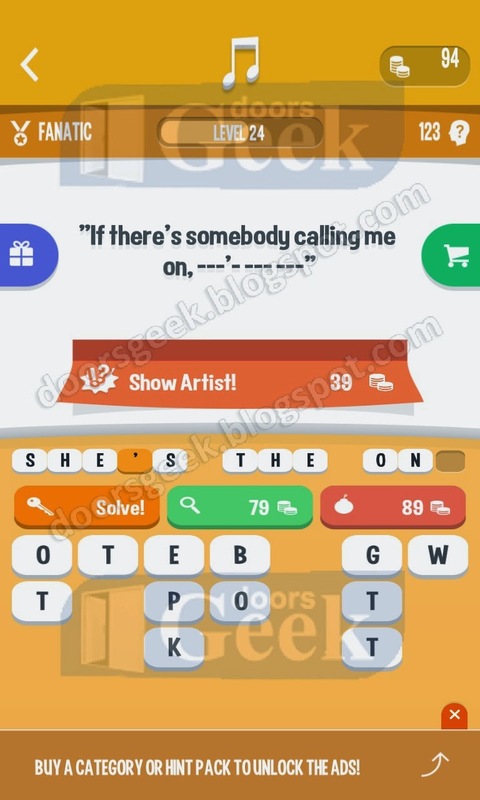 Hint: "If there's somebody calling me on, ---'- --- ---"
Song Quiz [Fanatic] Level 24 Cheats, Solution for Android, iPhone, iPad, iPod. Hint: "I want to see you ---- --- for me"
Song Quiz [Fanatic] Level 23 Cheats, Solution for Android, iPhone, iPad, iPod. Hint: "If ten million ---------- lit up the world"
Song Quiz [Fanatic] Level 22 Cheats, Solution for Android, iPhone, iPad, iPod. 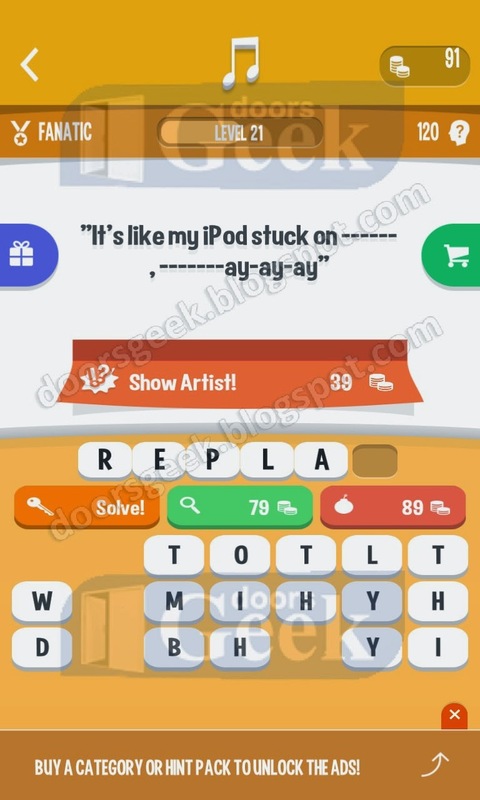 Hint: "It's like my iPod stuck on -----, ------ ay-ay-ay"
Song Quiz [Fanatic] Level 21 Cheats, Solution for Android, iPhone, iPad, iPod. 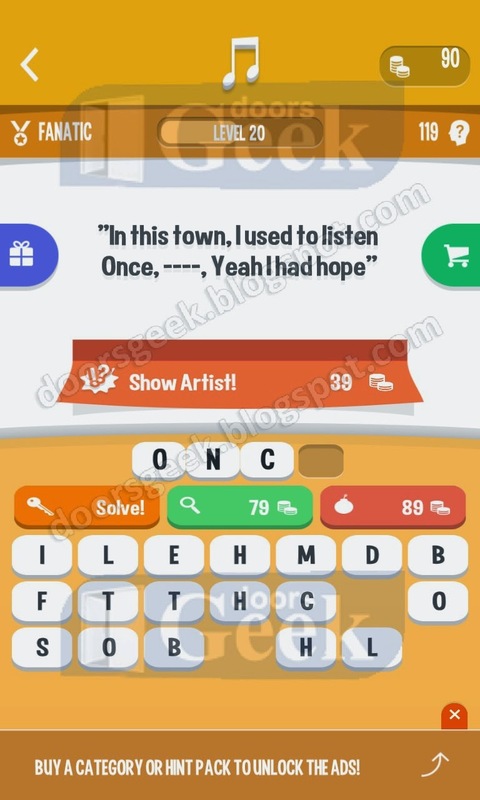 Hint: "In this town, I used to listen once, ----, Yeah I had hope"
Song Quiz [Fanatic] Level 20 Cheats, Solution for Android, iPhone, iPad, iPod. 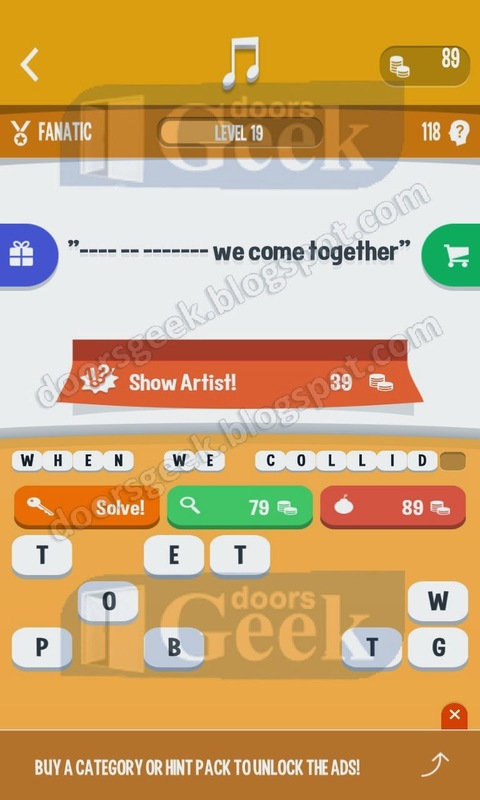 Hint: "---- -- ------- we come together"
Song Quiz [Fanatic] Level 19 Cheats, Solution for Android, iPhone, iPad, iPod. Hint: "--------- I try to fly I fall without my wings"
Song Quiz [Fanatic] Level 18 Cheats, Solution for Android, iPhone, iPad, iPod. Hint: "Cause ---------, she's out of my league"
Song Quiz [Fanatic] Level 17 Cheats, Solution for Android, iPhone, iPad, iPod. 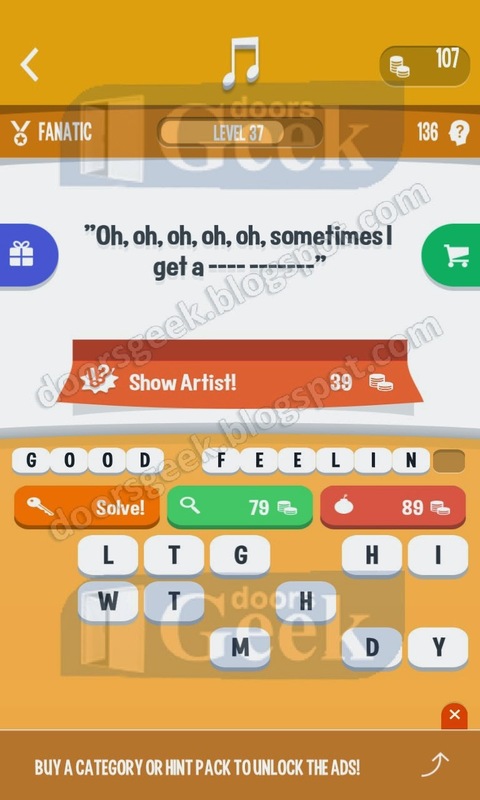 Hint: "Good, good, good, ---- ----------"
Song Quiz [Fanatic] Level 16 Cheats, Solution for Android, iPhone, iPad, iPod. 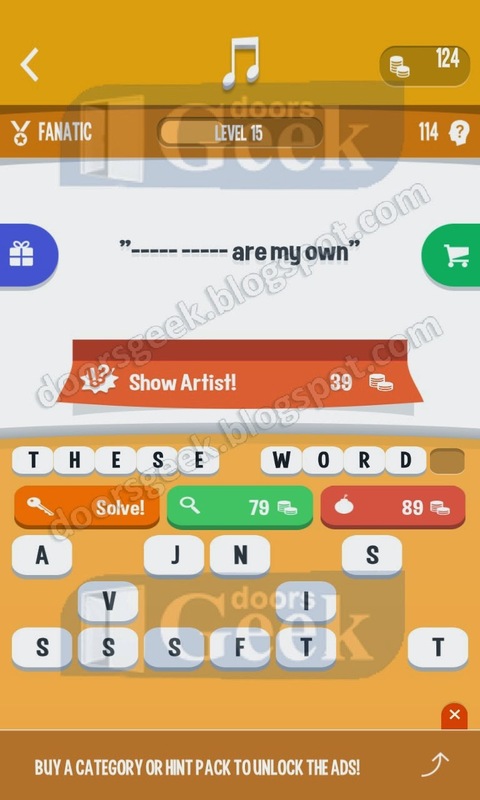 Hint: "----- ----- are my own"
Song Quiz [Fanatic] Level 15 Cheats, Solution for Android, iPhone, iPad, iPod. Hint: "Listen to the -----. 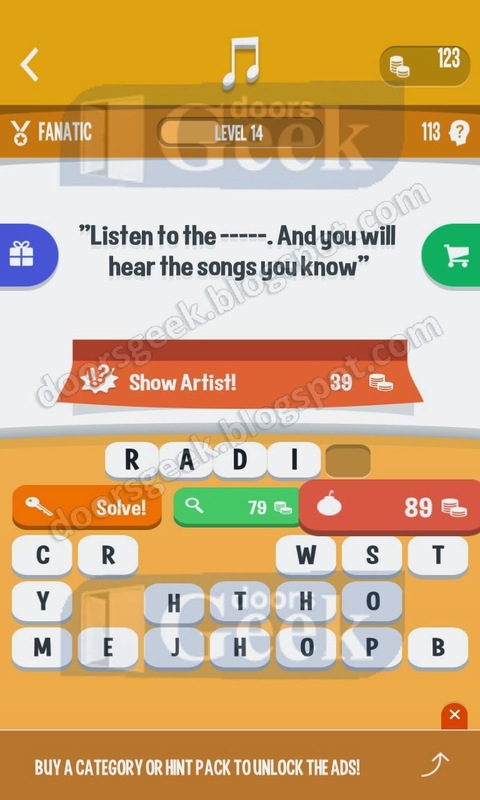 And you will hear the songs you know"
Song Quiz [Fanatic] Level 14 Cheats, Solution for Android, iPhone, iPad, iPod. Hint: "Oh, why you look so sad? Tears are in your eyes"
Song Quiz [Fanatic] Level 13 Cheats, Solution for Android, iPhone, iPad, iPod. 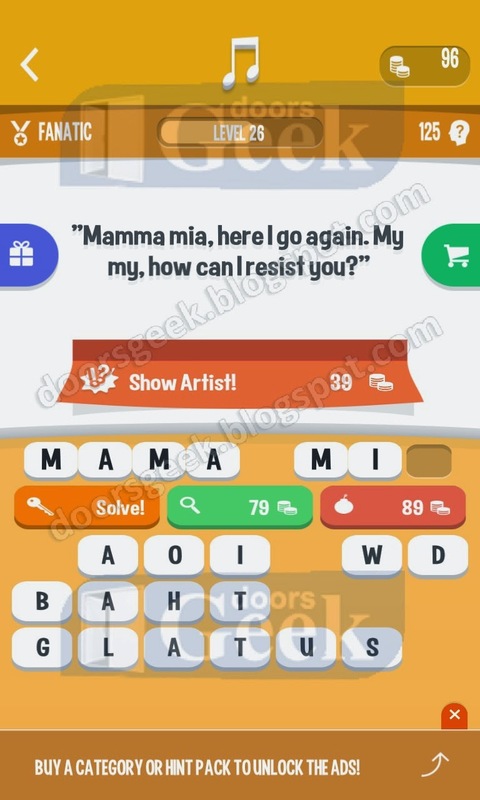 Hint: "am --------- no matter what they say"
Song Quiz [Fanatic] Level 12 Cheats, Solution for Android, iPhone, iPad, iPod. 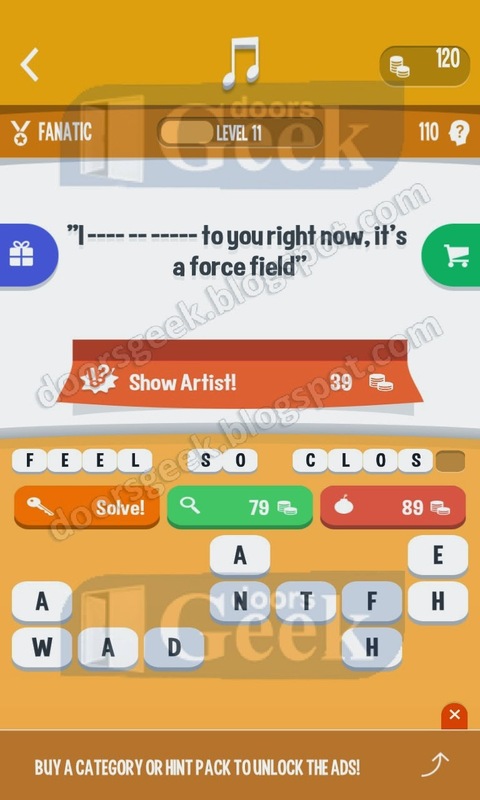 Hint: "I ---- -- ----- to you right now, it's a force field"
Song Quiz [Fanatic] Level 11 Cheats, Solution for Android, iPhone, iPad, iPod. Hint: "Maybe I pulled the ----- ----"
Song Quiz [Fanatic] Level 10 Cheats, Solution for Android, iPhone, iPad, iPod. 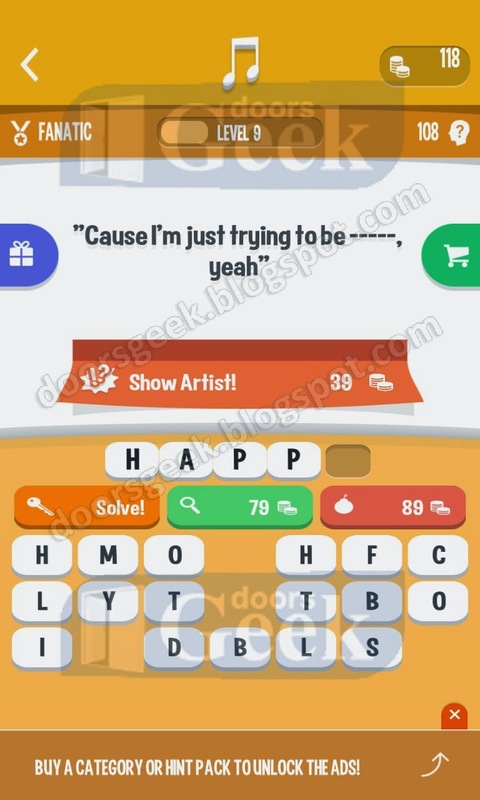 Hint: "Cause I'm just trying to be -----, yeah"
Song Quiz [Fanatic] Level 9 Cheats, Solution for Android, iPhone, iPad, iPod. Hint: "I can do it even better in ------ -----"
Song Quiz [Fanatic] Level 8 Cheats, Solution for Android, iPhone, iPad, iPod. 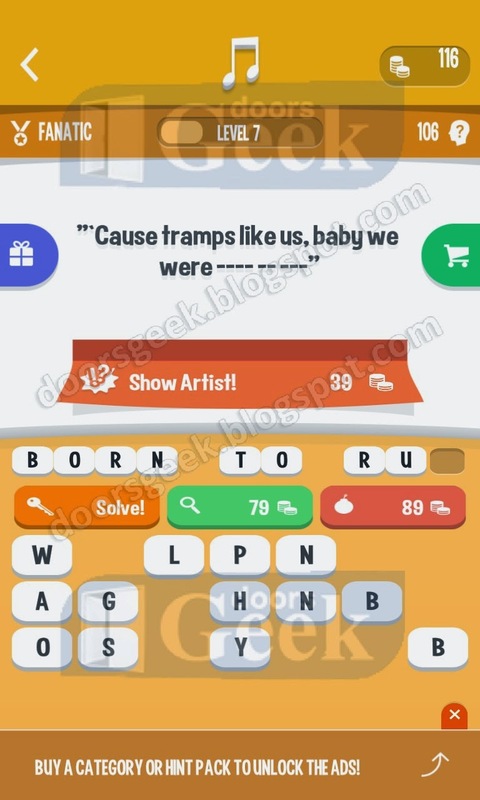 Hint: "Cause tramps like us, baby we were ---- -- ---"
Song Quiz [Fanatic] Level 7 Cheats, Solution for Android, iPhone, iPad, iPod. Hint: "--, give me a beat I can rock to"
Song Quiz [Fanatic] Level 6 Cheats, Solution for Android, iPhone, iPad, iPod. Hint: "Get your passport and your bikini, you need a -------"
Song Quiz [Fanatic] Level 5 Cheats, Solution for Android, iPhone, iPad, iPod. 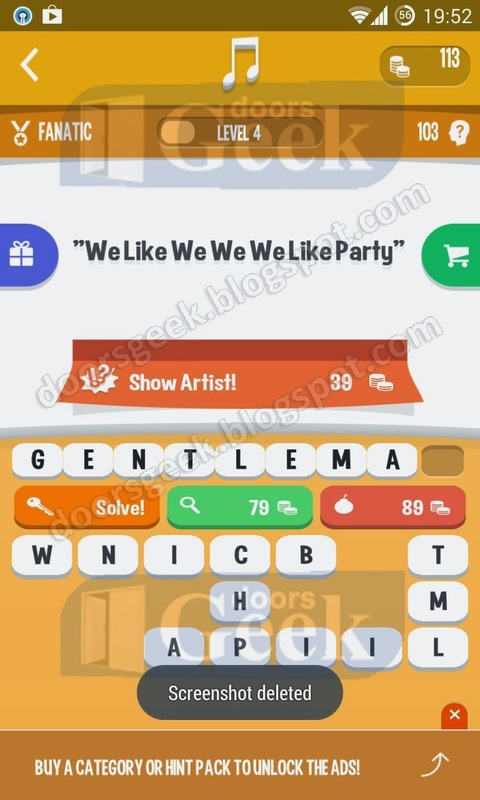 Hint: "We Like We We We Like Party"
Song Quiz [Fanatic] Level 4 Cheats, Solution for Android, iPhone, iPad, iPod. 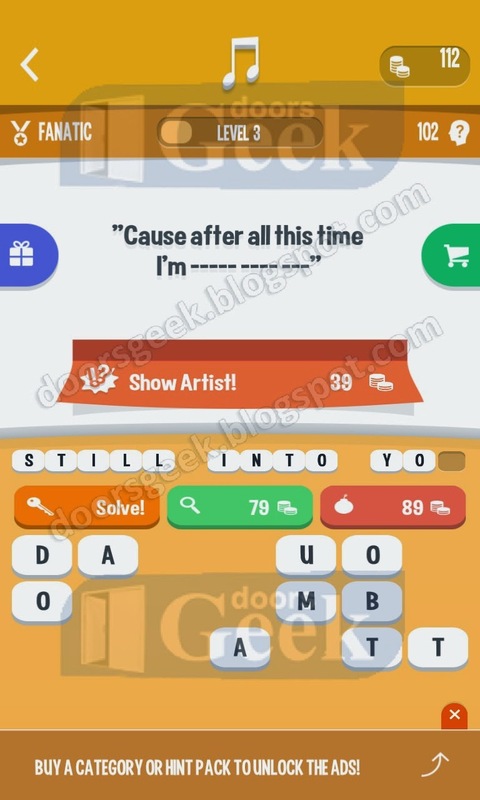 Hint: "Cause after all this time I'm ----- ---- ---"
Song Quiz [Fanatic] Level 3 Cheats, Solution for Android, iPhone, iPad, iPod. 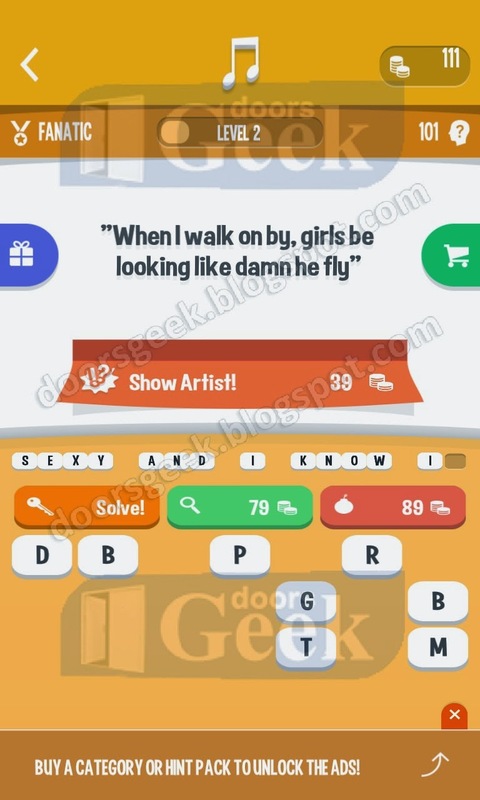 Hint: "When I walk on by, girls be looking like damn he fly"
Song Quiz [Fanatic] Level 2 Cheats, Solution for Android, iPhone, iPad, iPod. Hint: "------- ---- be the last to kiss my lips"
Song Quiz [Fanatic] Level 1 Cheats, Solution for Android, iPhone, iPad, iPod.